Another chat session, this time with two Australian string quartets: Orava and Pietra. Orava played the other day so I know them for that. They are the seniors (relatively) having established themselves, studied in the US with the Takacs Quartet, got an agent and a CD with Deutsche Grammophon Australia (impressive) playing Tchaikovsky, Rachmaninov and Shostakovich, making their name at festivals, committed and needing to eat. The Pietra Quartet are still students at Sydney Con, developing the group, still to decide on a whole range of things like their image and style and key repertoire. I know violist Justin as he performed the Stamitz concerto on our Musica da Camera CD. Younger and developing but on the path. 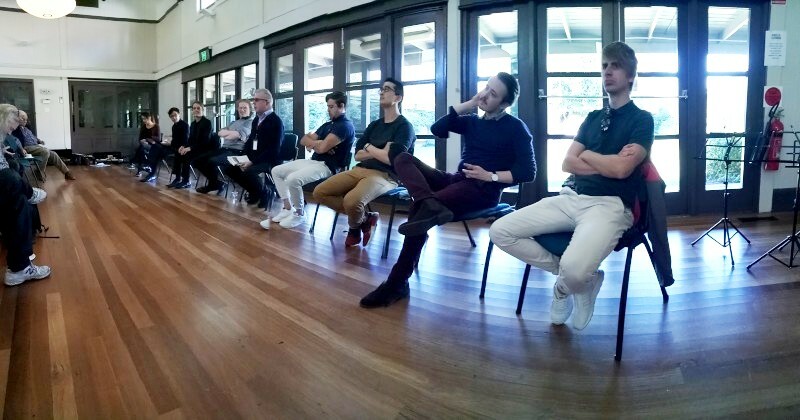 This all came out in discussion with moderator Vincent Plush, ABC radio presenter, ex-music lecturer and the rest. The discussions were brief but relevant: identity and presentation; naming (Orava means squirrel in Finnish); getting together and staying together; approaches to music and sound; choosing repertoire; experiences with the Australian repertoire; interestingly, "where is home"; AYO in their development (most had been AYO performers); cultivating audience; women in string quartets (not at all an issue for youth, but some historical relevance); instruments, old and new; Queensland's Year 3 string program; performing live vs recording. Lots of thoughts there, so no time for any short performance. I didn't ask my question, but it would have been "do you still play weddings", or, survival skills for musicians. Lots of interesting chatter. Vincent Plush (moderator) interviewed the Orava and Pietra String Quartets. Orava comprises Daniel Kowalik and David Dalseno (violins), Thomas Chawner (viola) and Karol Kowalik (cello). Pietra comprises Anna Da Silva Chen and Ben Tjoa (violins), Justin Julian (viola) and Miles Mullin-Chivers (cello).